I got this recipe from The Pioneer Woman, who calls these Crash Hot Potatoes, but for whatever reason, I keep calling them Hot Crash Potatoes in my head. Maybe because it sounds more like hot cross buns or hot mashed potatoes. Regardless, whenever I get small potatoes in my Boston Organics delivery, I get really excited because it means I can make these. It's not the fastest recipe, and you end up having to use multiple pieces of cookware (since you have to first boil and then bake the potatoes), but in my opinion, it's worth it. These potatoes end up exponentially crispier than regular roasted potatoes without all the mess and greasiness involved with frying. The only thing is, my potatoes have never been as photogenic as the ones on The Pioneer Woman's site. Hers remain in one piece, and she writes that, "you almost want it to resemble a cookie." Mine split in half and look more like Humpty Dumpty after he fell off the wall. But since I'm usually just making these for myself to eat, I don't really care. 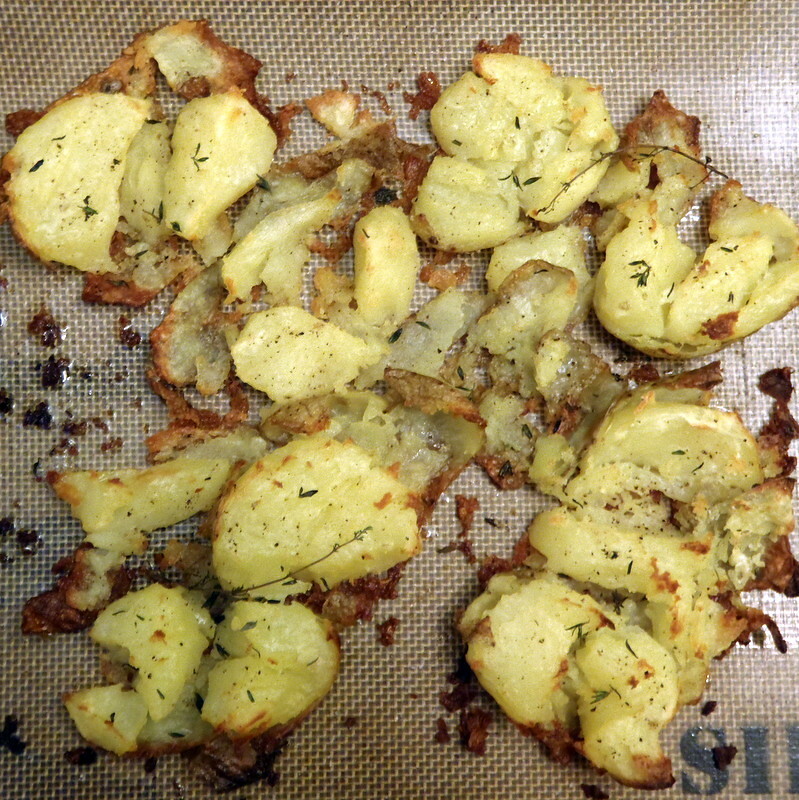 I just continue to smoosh them until there's plenty of surface area for the olive oil to catch onto and make crispy. Bring a pot of salted water to a boil. Add in as many potatoes as you wish to make and cook them until they are fork-tender, about 20-30 minutes depending on the size of the potatoes. Drain well. Preheat oven to 450°F. On a sheet pan (I line mine with a Silpat), generously drizzle olive oil. 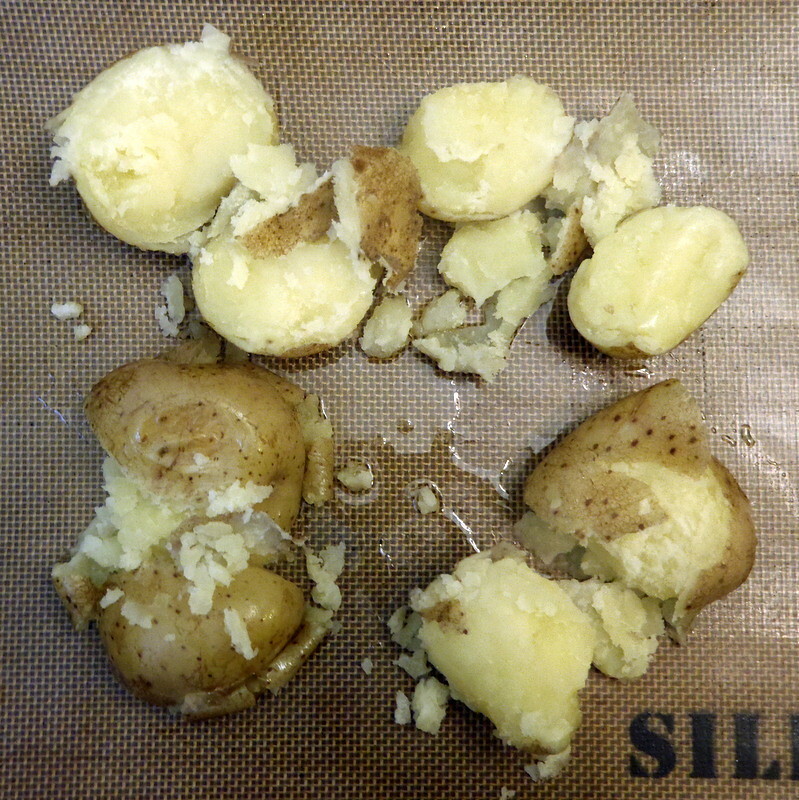 Place tender potatoes on the cookie sheet and with a potato masher (I use a slotted spoon), gently press down each potato until it slightly mashes, rotate the potato masher 90 degrees and mash again. Crowd the potatoes close to each other and carefully drizzle olive oil on top, making sure that almost all the surfaces are covered with oil. 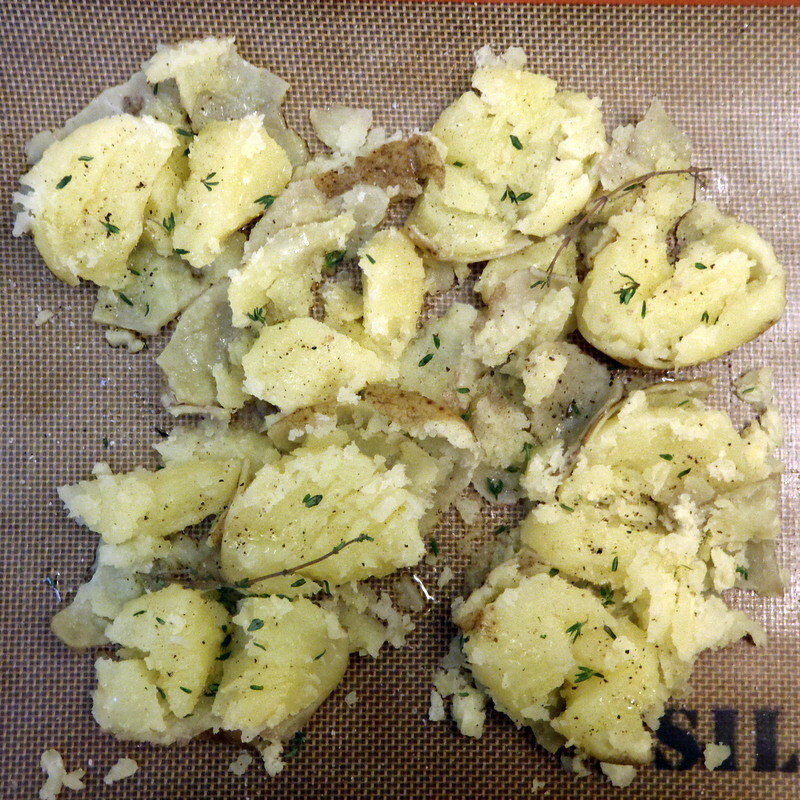 Sprinkle potatoes with kosher salt, fresh ground black pepper and fresh chopped rosemary (or chives or thyme or whatever herb you have available). 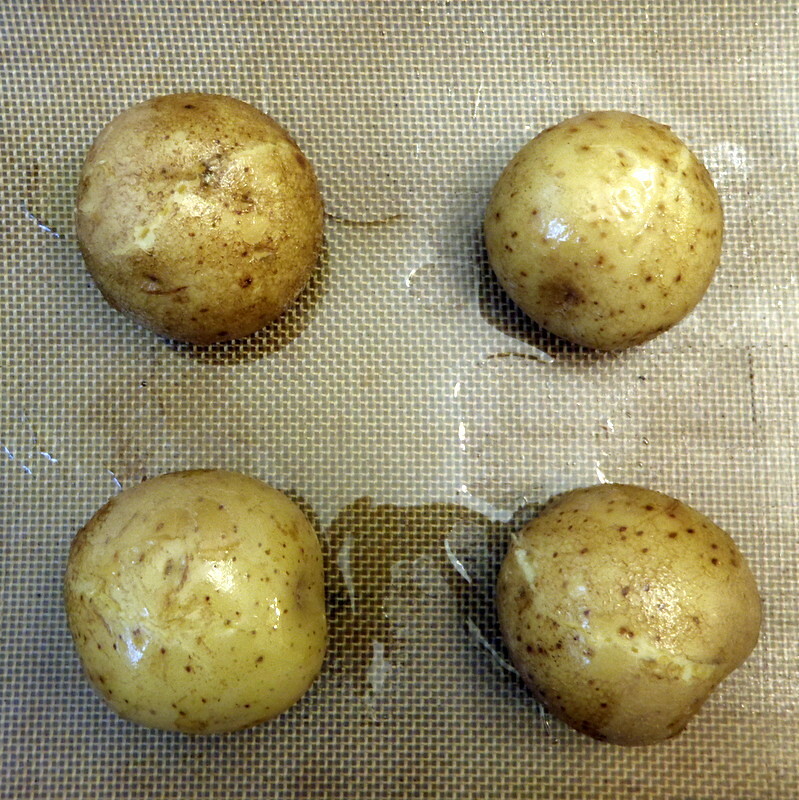 Now spread the potatoes further apart on the sheet. Edited to add: I wanted to make these today but the only potatoes I had were a little too large so I just cut them in half before adding them to the boiling water. Then I put them skin side down on the sheet before smooshing them. They looked a lot more like the Pioneer Woman's potatoes this way but turned out less crispy because the cut side was exposed to the boiling water. They were still really delicious, though, and it took less time to boil them so this was definitely a "why didn't I think of that before?" moment. Yes, I love this way of baking potatoes! It's just so yummy! Have you tried this with microwaving the potato first instead of boiling? I've been lazy to boil mine and instead I just throw it in the microwave for a few minutes. Regardless, this looks really yummy! No, I haven't tried that, but it's definitely an idea worth trying! Let me know how it works out! Mine didn't come out as nicely brown as yours, I accidentally put it on 400 instead of 450, then I got tired of waiting, lol. 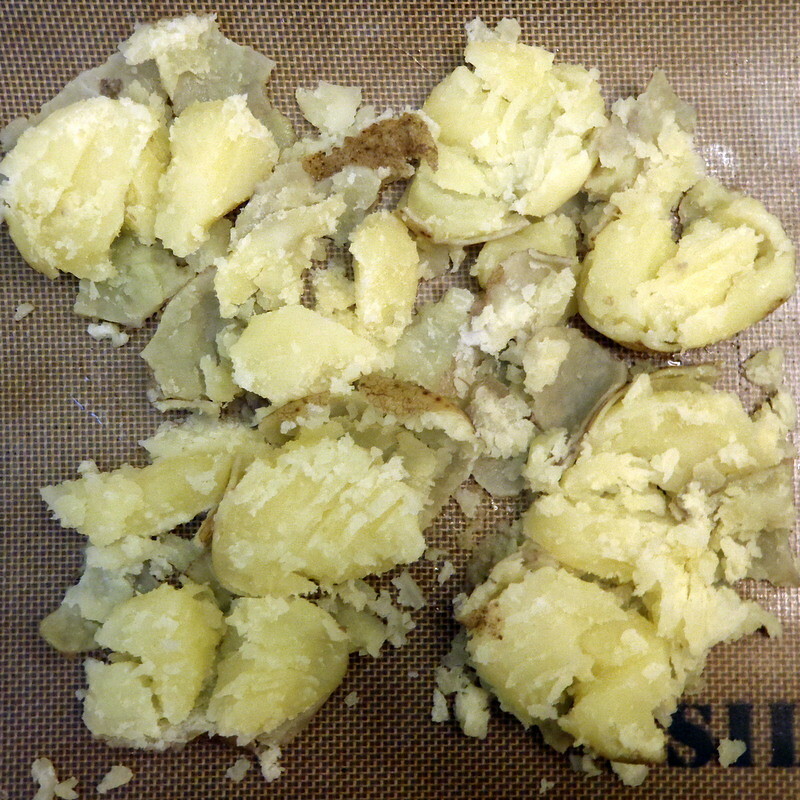 The microwave method worked out pretty well though, took 4 min to make the 2 potatoes I used. Forgot to say that it was really good, especially the crispy skins!